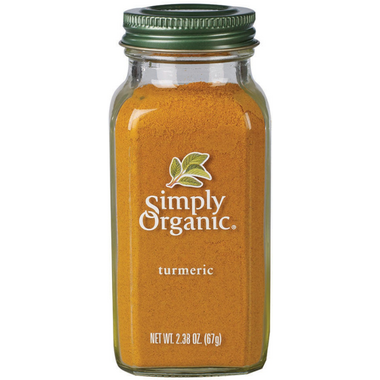 Simply Organic® ground Turmeric root has a deep golden-yellow color and a distinctive, pungent aroma. Its flavor resembles both ginger and pepper. Indispensable in curry powders and East Indian cooking, turmeric is also used in mustards, dressings, eggs and rice dishes. Simply Organic's turmeric is sourced from India and Guatemala. I like the glass jar packaging. Great value ... the jar is large so this will last me a long time. Spice is fresh... great flavour. I am a huge fan of the Simply Organic Spices. I just wish that the whole range was offered on well.ca. Organic and easy to sprinkle on my dishes. Great quality. Great product. Like that it's organic. Excellent product and the price is fair compared to buying it in a store. I'll re-order. Great to make drinks with! An excellent way to add to your food. Great price too. Handy and easy to use. Excellent taste on a lots of food. Great quality in the bottle and so easy to use and taste great in my stir-frying or adding in curry or even in pancakes!! Love it! Love this turmeric. Itâ€™s so fresh and glass bottle is great. Will definitely buy again. Really fresh and love the glass bottle. I usually add a good teaspoon to my smoothies! after using grocery store product all my life- I tried this organic turmeric. Could not believe the difference, the freshness, no fillers -doesn't taste like sand. I will never go back. Great quality, love the glass bottles. This spice is the king of spices. So healthy! I try to put it in everything because it is so beneficial! Wanting to get and have organic products. Heard that turmeric has good qualities for our health. Wanted to try this one for that. Nice, organic product. I sprinkle on everything because I believe in the anti-inflammatory benefits of turmeric. Great taste, good portion, and great price! Thank you Well.ca! Good size bottle and good product! I think that my jar was defected. There was extra black particles once wet that felt like texture of sand grains. Made a check with the expiration date and it was still okay. Didn't seem right still and reported it about it. After report got a new replacement, the two were separate colours and smell. The old jar looked darker and didn't have as much smell, maybe it was stale that could by why it tasted like sand grains. The new one is a lot more fine, doesn't have the black dirt looking particle and sand grain feeling. Will discontinue use of the original and hope that the replacement is safe now. Love Turmeric, but can't ever find it in area grocery stores - especially organic. Thankfully, Well.ca has this great brand, & at an amazing price! The simply Organic line is superlative. The jars are a generous size and of a design that sits well either on a shelf or lying flat in a drawer. The opening is generous and easy to use for measuring spoons. This tumeric is very fresh, fragrant and possibly the best I have ever used. Love! Will purchase again for sure! I add this turmeric powder to Lundberg Indian Basmati rice along with curry powder which adds flavour to the already delicious rice. I also tried it sprinkled into a bag of plain potato chips, shake the bag and presto, you get an exotic tasting chip. At the rate that I'm using this stuff I'll have to order another bottle. Use it in most of my recipes and like that it has health benefits and is organic. I always buy this brand! It is the best. I use it in most of my cooking! I really enjoy this brand. The turmeric is organic and has great flavour. Love this product - am trying it on many dishes as the health benefits are so great!! Will buy again. I am new to using tumeric, but is amazing on rice with coconut oil mixed in and salted to taste. Will be trying it on lots of things! I'm on my second bottle. I put this in almost everything. Omelettes, salads, rice, spaghetti, anything that is stir-fried, tea etc. It doesn't have a very strong taste it just adds a hint of "tastiness" to things and it is incredibly healthy to eat. Definitely a quality product that has become a staple in my pantry. Delicious and healthy. I love that it is organic. Good product. This spice can be used in different ways. It can be used for cooking, but I've heard of people using it for other reasons. Can even be applied to skin, and can be rubbed on certain spots for an anti-inflammatory effect. If you research this online, you'll come across some interesting remedies that involve turmeric. First time buying and will purchase again. Good price for an organic item of this quantity. Also love that the bottle can be reused! A fresh organic product, the color is impeccable, tastes great! tumeric is so good for you and being organic makes sure none of that is deminished. Nice big bottle too. I switched a lot of my spices for the Simply Organic brand. I love that they are organic and packaged in glass, not plastic. They are well priced considering the size of the jar. Nothing more to say than "Perfection!" It is delicious and a little goes a long way! Can't forget to mention the great service at well.ca, too! Love this site!